In 2001, Ben & Jerry’s ice cream was sold to Unilever, a British-Dutch conglomerate. Under the founders Ben Cohen & Jerry Greenfield, the Vermont-based company had built a corporate image of social consciousness & liberal activism which Unilever attempted to maintain. But in contrast to their image, since 1987 the company has had manufacturing facilities & retail outlets in Israel. To justify this the company said, “We are a values-based business & we do our best to make values-based decisions including investing in local farmers in the region.” A worthless statement that does not address Israeli apartheid, dispossession, & genocide against Palestinians & tries to blow smoke up our rumps. This nefarious relationship with Israel has earned them a long-standing place of ignominy on the BDS list of companies to boycott. 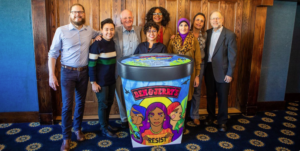 Apparently the BDS boycott is having an impact on Ben & Jerry’s business so they just pulled a savvy political stunt to make an end run around the boycott. With great public display, they announced a new flavor called Pecan Resistance with the profits to go to the Women’s March & they put on the whole dog & pony show with Linda Sarsour, the Palestinian-American who heads the Women’s Marches. This is intended to knock progressives for a loop & to counter BDS. Do we honor BDS or do we help bankroll the Women’s March? It’s a repugnant counterposition of Palestinian solidarity versus women’s rights. The answer to this apparent conundrum is very simple. The lives of Palestinian women matter too. In solidarity with their struggle against apartheid & genocide, we do not accept hush money at their expense. Not a dime & that is not negotiable. Linda Sarsour will lose all credibility not just as a Palestinian supporter but as a leader of the Women’s March if she does not reject this malignant con. In the struggle against genocide, no one can play both sides of the street; she has no right to compromise the struggle for women’s rights by throwing Palestinian women to the wolves. Those who support BDS & those who stand for a principled fight for women’s rights should go to her FB & Twitter walls or contact her in any way possible to protest her acceptance of hush money from Ben & Jerry’s because of their economic & political relationship with Israel.